Climate change negotiators who will gather in Paris later this month enjoy broad public backing for their efforts, according to a new Pew Research Center survey. People polled in 40 nations that account for 76% of the world’s population say global warming is a very or somewhat serious problem, and they overwhelmingly want action to curb greenhouse gas emissions. But such broad support masks significant partisan differences in some key countries that may complicate implementation of any climate accord. Several wealthy nations, including those among the top 20 carbon dioxide-emitting nations, have strong political divisions on the issue. 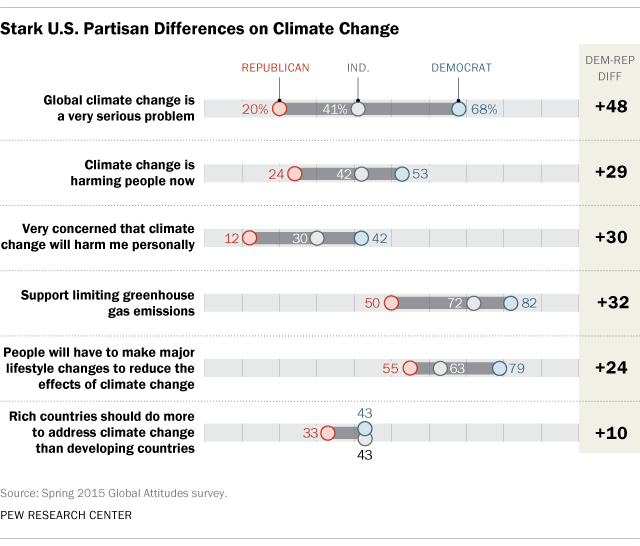 Nowhere is this partisan divide potentially more consequential for the success of any international effort to slow global warming than in the United States. Just 45% of Americans express intense concern about global warming. But Democrats (68%) are much more concerned than Republicans (20%) about climate change, a 48-percentage-point differential. And Democrats (82%) are more willing than GOP adherents (50%) to support government efforts to reduce CO2 emissions, a 32-point gap. Democrats are also 24 percentage points more likely than Republicans to believe that people will have to make major lifestyle changes to reduce the effects of climate change, and are 10 points more likely to say rich countries should do more than developing ones to address the issue. But the U.S. is not alone in its partisan clashes on this issue. In Australia, disagreements over global warming within the ruling, right-of-center Liberal Party contributed to the 2015 ouster of Prime Minister Tony Abbott and his replacement by Malcolm Turnbull. Just 16% of Australian Liberals think global warming is a very serious problem, compared with 58% of Labor Party supporters and 79% of Greens. Similarly, while 65% of Liberals back government action to curb emissions, that share is far smaller than the 88% of Labor backers and 98% of Greens who concur. In Canada, which in October elected a left-of-center Liberal government, there are similar partisan differences over climate change. Just 27% of the supporters of the Conservative party, which just lost power, believe that global warming is a very serious problem. This compares with 57% of Liberals. And, while 76% of Conservatives nonetheless back limits on emissions, 91% of Liberals support such action. 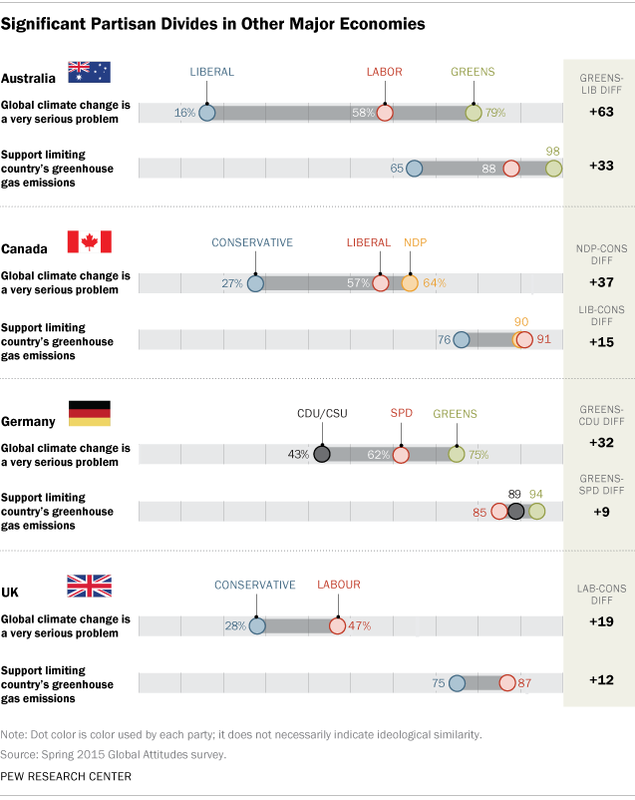 The partisan divide extends to Germany and the UK, where followers of right-of-center parties are much less likely than those with left-leaning parties to be worried about climate change. In Germany, adherents of the Green Party, which is not part of the ruling government coalition, are significantly more likely (75%) than backers of both ruling coalition partners, the right-of-center Christian Democratic Union/Christian Social Union (43%) and the left-of-center Social Democratic Party (62%), to see climate change as a very serious problem. Similarly, in the UK, supporters of the ruling Conservative Party (28%) are far less likely than backers of the Labour Party (47%) to be intensely worried about global warming. And Labour (87%) adherents are more likely than Conservatives (75%) to favor government action to limit emissions.